Interesting read about the state of Vancouver real estate. Safety aspect – low-risk investments are always popular with untrained "mum and dad" investors. Property fits this criteria with returns in some country areas reaching 10% per year. Housing in metropolitan areas is constantly in demand with the high purchase price being offset by substantial rental income and a yearly return of between 4% and 8%. High leverage possibilities – investment properties can be purchased at 80% LVR (loan to valuation ratio), or up to 90% LVR with mortgage insurance. The LVR is calculated by taking the amount of the loan and dividing it by the value of the property, as determined by the lender. This high leverage capacity results in a higher return for the investor at a lower risk due to having less personal finances ties up in the property (80% of the purchase price was provided by the mortgagee). Teranet for Nov 2012 was 138.2. I will predict 133 for June 2013 and 128 for Dec 2013. Peak was 146.930 for June 2010 so Dec 2013 would be 13% off peak. Which is 1/2 of my prediction of minimum total nominal decline, 25%. Most of those cities had big run ups and then dropped suddenly. In Victoria we had a run up to 2007/2008 and have been give or take flat since then. CRASH AND BURN - The housing bubble has burst, and few Canadians will emerge unscathed. This will be our saving grace I think that leads to a more moderate decline. Not a soft landing, but a softer one. Since the financial crisis Victoria has been floundering while the rest of the country continued to race ahead. Vancouver is hopelessly out of whack with reality. Motivated sellers are starting to really decimate the market. They are coming to market with 85% of assessed. The problem is, people still aren't buying. I've been noticing many more bank sales as of late. Lots more vacant houses sitting idle. The median price is getting calculated on a lower and lower sample every month. It will start declining very soon. My predictions for this year will be the crash of Vancouver. This will effect the economy of the entire province. Further Canada will begin the great recession. Our economic growth has been dependant on housing related industries for too long. Housing starts will start declining to below the level of household formation. Housing related industries will start to contribute to the unemployment rate. Also lets not forget the elephant in the room, the demographic shift. If national housing numbers dip 7% this year, every boomer that wants to retire and cash in on their house will rush to market. They will fiercely race to the bottom just to get a chunk of that beautiful equity. 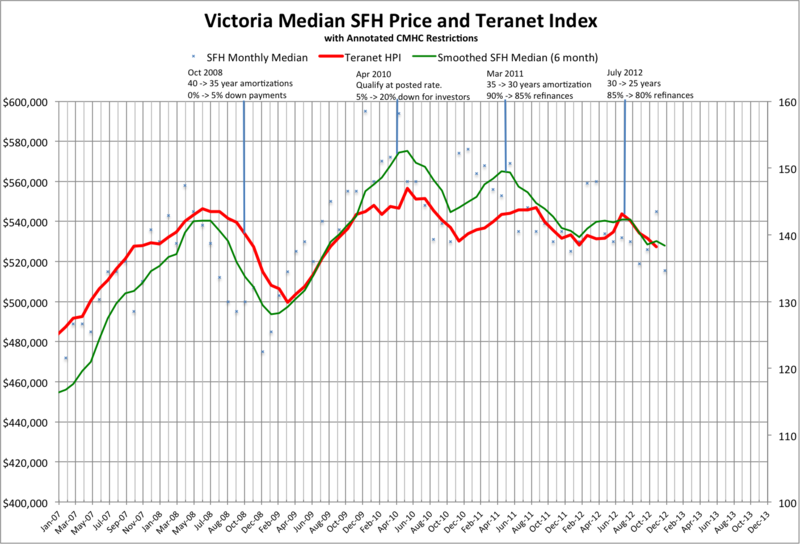 Victoria, 2015 nominal average SFH price = $345K plus or minus $70K, or back to 2003. And those who think the BoC can prevent a crash, should bear in mind that the US prime rate dropped from over 5% to nothing from 2008 to 2010, while the US housing crash continued under its own momentum. The price on 1566 Hampshire has just been cut for the third, or is it the fourth time, from an original asking of 2.2 million more than a year ago to 1,495 now. Will they ever catch up with the market, or will they eventually capitulate and accept something like what they paid — about $600 K? "This will be our saving grace I think that leads to a more moderate decline. Not a soft landing, but a softer one. Since the financial crisis Victoria has been floundering while the rest of the country continued to race ahead. Vancouver is hopelessly out of whack with reality." In no way has Victoria been in touch with reality. People in Victoria took on as much debt as they possibly could just as those in Vancouver did. Vancouver house prices went much higher after the dramatic, emergency intervention of 2009, which was to be expected of all Canadian cities given the massive amount of housing market stimulus at that time. The fact that Victoria did not surge much higher is not a sign of stability at all, it is a sign of market weakness. Victoria's weak market moved somewhat higher, peaked in 2010 and has been declining since. Houses listed at 34% and 36% below assessed value is a true sign of market health and direction. That same weakness is apparent in the Teranet HPI numbers as Victoria leads all Canadian cities in price declines. If what you say is true, that the relative price flatness in comparison to Vancouver's market is a positive thing for Victoria going forward, then Victoria would not be leading the country in a price correction. On the other hand, you do say that Victoria will not experience a soft landing, which is something that I agree with. "Long possession dates if needed." So I should buy now before the market completely collapses in Sooke and take possession later. Genius. It's interesting that a mainstream media outlet, such as Macleans, is so direct in calling out the truth - that we are in the early stages of a collapse. "The housing bubble has burst, and few Canadians will emerge unscathed". The words "crash" and "bubble" are met with anger and denial to this day by most of the public, including many people who comment on this blog. A person using these words can be labelled "extreme" by housing bulls. However, the use of those words is becoming more acceptable all the time as the public starts to realize the truth about Canada's housing market. Macleans has done its part and should be thanked by all Canadians. I've been noticing many more bank sales as of late. Anyone know if there's a way to get stats on this? It would be interesting to know the percentage of bank owned or foreclosure sales over time in Victoria. I don't think it's either or, it's both. Victoria is weaker than the rest of the country, and as a result is now more stable than if it had continued to appreciate. Ie, it the stability is relative to if we had gone as other cities have, rather than relative to other cities. Sure, but the declines have been very gentle so far. It should be pointed out that Macleans doesn't exactly have the best track record here. They've been running a variant of this story for a few years now. "And those who think the BoC can prevent a crash, should bear in mind that the US prime rate dropped from over 5% to nothing from 2008 to 2010, while the US housing crash continued under its own momentum". I, too, have made this observation. In fact, the US housing collapse continued for another 2 to 3 years after the dramatic drop in interest rates. If rates in Canada were to be dropped (they will not), it could only be by a minute amount in comparison to the rate cut the US and Canada experienced in 2009, therefore having little to no effect on the housing market. We are already at emergency interest rate levels. Japan also saw its housing market continue to crash despite emergency interest rates. They are now in their third straight decade of extremely low rates and there has yet to be a recovery in their housing market. We have to remember that the Teranet HPI is a product of banks. The fact of the matter is that both the Vancouver and Calgary real estate boards have recently revised their HPI methodologies at least 4 times since they put them in place. The timing was perfect - exactly when the housing market downturn started. Each revision has been favourable to maintaining the illusion that house prices are either level or rising. I am not saying that Teranet has revised their methodology since 2009, but it wouldn't surprise me. At that time, their charts seemed to be more representative of what was actually happening in the housing market. Again, housing bulls, you are choosing to deny what is actually happening in the housing market by using one of your favourite tactics - discredit the source. You cannot discredit the facts that are presented in the article. These are the words of a Vancouver realtor, not the opinion of Macleans. Again, factual information from a reputable, outside source and not the opinion of Macleans. More of the same from the rest of the article. No Canadian media outlet has been this blunt so far. Very telling. I think 500k will be the median. To jump start the low end of the market prices have to come down. We still have yet to see the full effect of the CMHC slowdown. Stories of sales falling through due to financing are becoming more and more common. I say: We have just moved here and are renting. Feedback: Oh - the houses here are really expensive aren't they. I say: We are enjoying living in Victoria and renting is working nicely. Feedback: Oh - are you looking to buy soon? I say: We are living in Victoria and renting a place - looking forward to our first Christmas here. Feedback: Why bother buying when it will be cheaper next month. I say: We are living in Victoria and decided to continue renting for a while longer. Feedback Prediction: You are lucky to be renting. We'll know the market has crashed when people I am casually chatting with provide that feedback! "Because it sells their rags..."
Mainstream Canadian media outlets have been feeding, as fact, the bullish spin of real estate boards to the public for decades. The housing industry is a major source of advertising revenue for these outlets. The media has been catering to the opinion of the Canadian real estate industry for far too long because it brings in advertising money. You obviously failed to see that this was happening and were quick to pin this type of motivation on Macleans. It is good to see that some of these outlets have recently started to state the facts and not just the spin. And info, why don't you make a personal contribution to this blog and tell us your prediction? I'm only going to put my guess out there for Oak Bay because I don't know other areas well. As for the interest rate, I expect it will stay pretty much the same this year. There is no published index for Oak Bay so your prediction is unverifiable. But I don't think it's too far off. Unverifiable... I like those odds. Macleans has done its part and should be thanked by all Canadians. info, you are nothing if not naive. Mclean's isn't trying to warn Canadians of impending doom; they're trying to sell magazines--only. The more shocking the cover story, the better. Not sure, but if you make one in this thread you'll have one to read next year. Aside from the onslought of external macro black swans peeking over the horizon awaiting to crush global economies, including Victoria Real Estate, I predict that the largest correction is still yet to come after we see two consequitive interest rate rises with a high likelihood of more coming. Of course, any smart economist would never go out on a limb and attempt to predict both the event and the timing. That's purely a fool's endeavour, and what they call in the industry a "CLM" (career limiting move). With my brilliant prediction above, I'm likely to eventually be right. The only other erudite prediction I can make is that we're bound to see more of the same, until something changes. I should be in the psychic business. Oh wait, I am. That's purely a fool's endeavour, and what they call in the industry a "CLM" (career limiting move). Leo, You will have to do a graph with the predictions. Then as time goes on we can see where we all are so far...a horse race. That said, everyone should answer 1-4 with specific numbers so that can actually be done. Re: "The constantly wrong predictions of economists and RE industry reps don't seem to hurt their careers." They cannot be constantly wrong. That would take genius. But they are probably wrong almost exactly half the time, for if they could predict the direction of a market with significantly better (or worse) than 50% accuracy they, or those betting against them as the case may be, would soon have all the money. As long as there is a market, it means that prices are essentially unpredictable and nobody bets right more than 50% of the time, except by mere chance. I think, actually, someone received the Nobel Economics prize for pointing that out in rather more obscurely mathematical terms. "The house is now showing as $60,000 LESS than what they paid for it in 2010." "I know BC assessment isn't the end all be all for a home's market value but how will they be able to sell it for enough to cover their mortgage if it's already dropped that much since buying only 2 yrs ago?" "I own a waterfront house that was assessed at $1,100,000 back in 2007. The new assessment this year is $730,000. One of my rental homes has gone down $150,000." "I can't drop the rents because the mortgage payments will still be the same or even likely increase"
"The elderly lady next door to me is however in real trouble. Her home was worth way over one million and now worth way under. She has to move into a care facility and this was to be paid for by the sale of her house." "buy now or be priced out forever" leaves the common nomenclature just as "under water" enters. "Values are unsustainable based on incomes, economic growth, wage gains, employment levels or migration and offshore investment. There are a myriad of reasons for real estate to lose value, and virtually none why it should recover. The decline we’re starting to witness now will only accelerate after 2015 because of negative demographics, let alone normalizing interest rates and debt deleveraging." This quote will be met with anger and denial by the bulls on this site. They will proceed to attempt to discredit Garth Turner. Instead of simply dismissing anything at all written by Garth Turner before you actually read it, bulls, actually read it for once. Explain to us why you disagree with the above quotation. Do you think incomes, economic growth, wage gains, employment levels or migration and offshore investment support current house prices in Canada? If so, why? Do you think that the decline we’re starting to witness now will not accelerate after 2015 because of negative demographics, normalizing interest rates and debt deleveraging? If not, why not? I appreciate your input bulls. It is refreshing to finally see you not trying to discredit the source (every time you see something that doesn't mesh with your own wishes) and coming up with your best attempt to falsify what is actually written. I'll give you one reason info...because it has been sustained for 5 years now since hitting the ceiling... Also, is there actually any true blue bulls on this blog? 6) Victoria unemployment Nov 2013 - 5.7% (currently 5.4%). I was tempted to change my BoC prediction just to be contrarian since almost all of us are saying 1%. I'd like to see more of the frequent commenters here post their predictions. Of course we will all be wrong to some extent (except if someone nails it by statistical fluke). But you aren't exactly risking much by posting some lighthearted predictions on HHV. By definition everyone here has an opinion on the RE market - why be shy! What is the multiple of average house price to average household income in Victoria? I believe I have only seen statistics on individual income. Introvert and Leo - I doubt that either of you is aware that, in 2008, Mcleans also correctly predicted the Canadian housing crash of 08-09, which we all know was halted only because of a massive, emergency intervention. Leo, you claim that Macleans has been running a variant of this story for a few years now. Where is the proof? And remember, the links have to show that the same basic article was written by Macleans more than once in the last 2 years. You are as guilty as dasmo and Introvert in terms of dismissing an entire article because it doesn't mesh with your own wishes. By dismissing the entire Macleans article, you are also dismissing the factual information provided in it by credible individuals. In this case, you have also dismissed the input of John Andrew, a professor who studies real estate at Queen's University and Ben Rabidoux, a well respected analyst at M Hanson Advisers. I think the BoC won't raise rates but mortgage rates will increase by 2%. Investing in real estate will be so 2011. The 6 month SFH average for Dec. 2012 was very skewed. The Teranet HPI clearly shows a strong decline in house prices for the same period in Victoria. As well, list prices as low as 34% and 36% below assessment have been observed. There are other indicators, as well, that show that the market has not been flat. We are clearly in the beginning stages of a collapse. 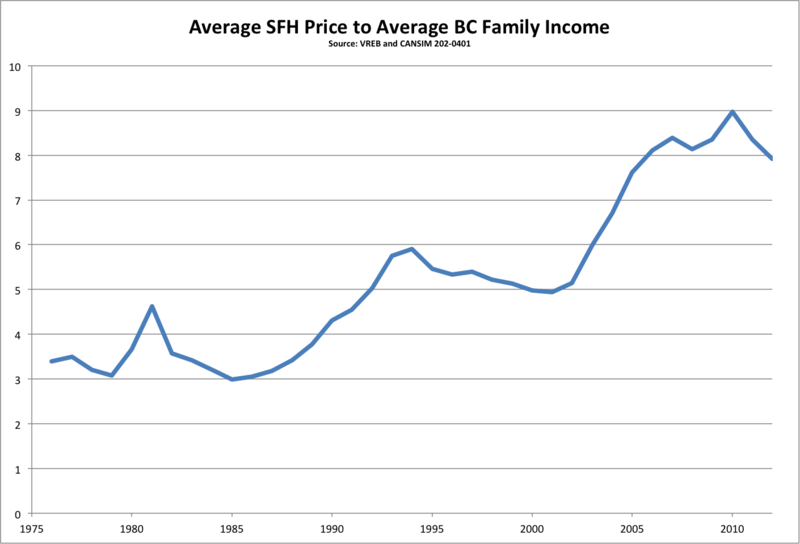 The 6 months SFH average is likely too high based on the fact that, starting in July, the mortgage rules changed. More rule changes were put in place in October. This knocked out a significant portion of the low-end buyers, keeping the average price higher than it should be. 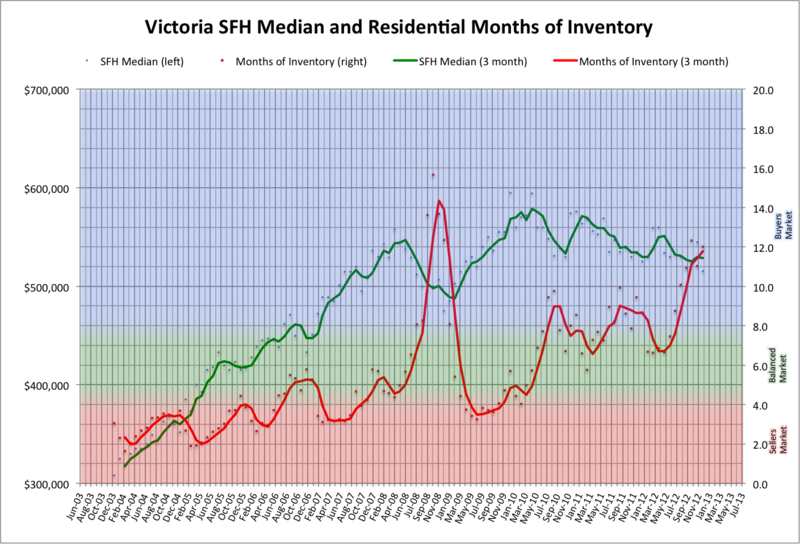 Therefore, the 6 month SFH average is not at all indicative of what is currently happening in Victoria's housing market. For this reason, I wouldn't use it in any prediction. just make your predictions already info! Variable - up 0.1% on Sept 4th and another 0.15% (to 0.25%) on October 23rd to offset growing inflation. Fixed - up 0.25% to 0.50% in mid to late 2013 due to investor exit from bonds to stocks (bond yields must go up). Good question - One wonders if info actually reads any of the postings here. None of the frequent posters seem exactly bullish. I guess if you redefine "bull" to mean anyone that challenges info's CERTAIN predictions of imminent doom then yes there are several bulls here. By that standard you could be bullish on stocks if you think the TSX will "only" fall 10% this year! Personally I don't discount the possibility of a very severe and sharp RE decline, I just don't think it is the most probable outcome. With these graphs we can see the predictions ahead. Thanks. These micro-predictions are silly, in my opinion. Why don't we instead focus our attention on who here has been generally wrong for years upon years? That means everyone who has expressed on multiple occasions any variant of the view that prices will crash soon and will crash hard. "Why don't we instead focus our attention on who here has been generally wrong for years upon years?" Don't have to. New time with a new situation. By dismissing the entire Macleans article, you are also dismissing the factual information provided in it by credible individuals. More naïveté. As if "credible individuals" with factual information have never once been proved wrong in any arena. I get the feeling that info is 16 years old. Does anyone else get that feeling? Why don't you, since you're so interested. You haven't given any examples. Why shouldn't we account for people's poor track record when evaluating their present-day thoughts? I have been wrong in magnitude, but not in direction, for a few years. Back in 2009, we were looking at a new town home in James Bay along Superior Street. We took a look through the town home and I just didn't like the quality, yet I could live with the place if I replaced the cheap cabinets. But we changed our minds and decided to wait instead. The new town home sold a few days later for $860,000. Well we have a second chance at the town home as it is back on the market for $599,000. But, I still don't like the cabinets or the floor coverings or the paint colors or the appliances. As the market cools I find myself more and more persnickety. My thoughts are that the typical two-bedroom condominium in the core districts will be selling under $229,000 and a starter home will be under $299,000 before the end of the year. Introvert, if we don't make these crazy predictions you won't be able to give us a large dose of "I told you so" this time next year. "These micro-predictions are silly, in my opinion." @Introvert - you are missing the potential to bask in blog glory if you make the best predictions. I said in the "core" districts. The core does not include Langford. Average house price to average income. 1. I've used BC income because Victoria income stats are quite variable due to low response rate. The BC income matches the Victoria income very closely though. 2. Median price/income would be a better measure. I have that data but haven't charted it. Leo, you claim that Macleans has been running a variant of this story for a few years now. Where is the proof? What happens when Canada’s housing bubble pops? There are lots of others, I'll let you google if you want. You are as guilty as dasmo and Introvert in terms of dismissing an entire article because it doesn't mesh with your own wishes. By dismissing the entire Macleans article, you are also dismissing the factual information provided in it by credible individuals. In this case, you have also dismissed the input of John Andrew, a professor who studies real estate at Queen's University and Ben Rabidoux, a well respected analyst at M Hanson Advisers. If you read what I post, you would know I link to Ben's blog fairly frequently, he does great analysis. But the point is not to say that Macleans are wrong, or the article is bad. The point is only that just because it is in a big magazine doesn't make it more true. In fact any mass media story will be less interesting because it leaves out the nuances and concentrates only on the big exciting headlines. What period? 6 months? In June the Teranet was 140.4, in Nov it was 138.2 or a 1.6% decline. Nov 2011 it was 140.64, so YoY decline in the Teranet is 1.7%. How is that a strong decline? For this reason, I wouldn't use it in any prediction. And you don't like teranet because the banks created it, and you don't like the average because it is skewed. So, pick a metric that you like and make a prediction on it. Tracking the new listings for the first 7 days of the New Year, nothing exciting. Some sellers are still not with the program and are pricing at 2010 levels. It's easy to criticize when you never make any statements that can be proven wrong. Make your prediction and I'll buy you a beer when next year rolls around and you're bang on. And teranet is another good one because it is our only repeat-sale index. So Intro, what's your macro-prediction. I made mine, off 40% in constant dollars by 2015. Where do say we will be in 2015. Up 50%, 100% or what? ...So all those houses that were converted to single family homes from multiple rental suites will go back. Or new zoning will allow you to add on to your house and convert your property into 4 or 5 "condos" or you will convert your home into two suites and sell half to your children. Or your children will move in with their children, Or the boomers are healthier than generations past and don't retire until their 70's. Or immigration is slowly opened up and it takes up the slack (Global population is estimated to grow by 1.3 billion, Canada by 50 million by 2025)... Just because a change is afoot does not mean there is a singular outcome. Dasmo, why are you so against house prices coming down? Why should real estate be so expensive? Are you also hoping that the price of cars goes up 7% per year? The price of insuring those cars goes up proportionally to the new values also. Or is real estate the only asset class that you want to be extremely expensive? The only part I disagree with is the subtitle. 1971, risky bad move. 2012, brilliant move. The problem is Canada’s dependency ration troughs in 2011, and then rises for the next twenty plus years! Indeed we can kiss any pensions goodbye. "... real estate marketing firm forecasts a brief, mild dip in sales volume in the first half of this year but not a major downturn"
"Many observers have noted that tighter mortgage rules brought in last July have made it more difficult for first-time buyers to borrow money.."
We don't need first time home buyers when we have knights of the real estate market such as these. "Motivated sellers! Quick Possession! (bought another House! ..."
If these guys want any attention they should be coming to market at $399,000. A whopping 44% above assessed. "Lots of potential". Ok - in ten years prices will be up ten percent in OB from where they are now. Even if prices are exactly where they are now, I will still have made 22% ROI each year after accounting for taxation (both for rental income and exemption for primary residence). I have no belief that I could reliably make the same after tax amount of money in any other type of investment. To sum up where I stand: I'm a Halibut not a Bear or a Bull. Prices relatively flat with -5% to -10% in the stats at some point or points over the next 3 to 5 years. I agree with you Dasmo. I don't really mind what happens because the real estate market is not under my control. What is under my control is my own budget and income potential. What I can do is minimize expenses and maximize income and analyze whatever the deal of the day is for investment - whether it be real estate or something else. In my view it is not about a real estate crash or a boom, but about affordability and projected long-term returns. The difference with real estate is that you have to live somewhere so there is another rent:buy calculation to work into the mix. Dasmo, you're right, I phrased my question incorrectly. "So all those houses that were converted to single family homes from multiple rental suites will go back. Or new zoning will allow you to add on to your house and convert your property into 4 or 5 "condos" or you will convert your home into two suites and sell half to your children." These measures will need to be taken if prices don't come down. But it doesn't seem realistic. Perhaps if we were truly "running out of land" that would be the case. However, we are not in a situation where new supply isn't coming to the market at a constant rate. The problem we have is too many people buying up the existing stock because they want rental income and future appreciation. It is because of this glut that when prices fall, they will fall at a shocking rate. Sure, nobody has to sell their primary house, they live in it. But what about that rental property that many people have. In my purely anecdotal opinion vacancy rates around Victoria are climbing quickly. Many apartment buildings around the city have multiple vacancies. When I look down off of my balcony at the parking lot and the one adjoining it, I see that half the spots are empty. How will the amateur landlords react to a drop in housing prices? Already they are being jolted out of dreamland by this years assessment drop. This combined with an increased vacancy rate will accelerate price declines. My macro-predictions? I think the halcyon days of 2:1 or 3:1 price-to-income ratios are never, ever coming back to Victoria, despite so many intimations to the contrary on this blog. If Victoria wasn't always expensive relative to most other Canadian markets, it will be from now on. On another note, if I may. Do we have concrete evidence that boomers are downsizing? I'm not saying that this is not the case; however, every boomer I know is either staying in their present SFH or else selling their SFH in favour of a different SFH. My experience could be an anomaly, of course. But perhaps the trend of boomers downsizing is being overstated. Here is reasonable evidence that other country boomers downsize or choose to rent at age 65. Here is Canada. The green line. Our pivot point is close to Ausi. That's not a prediction, its a cop out. A 2:1 price-to-income ratio would mean the average OB bung for under $150,000, which no one here has predicted or believes. Com'n, you can do better than that. Tell us what you think: are prices going up or down or are you predicting no change by 3015? Oops! no change by 2015, not the next millennium. All these "dependency" ratios are only charting the ratio of ages. it has nothing to do with people working or selling their homes etc. People will retire when they can or are forced to, not because they turn 65. I don't plan to retire ever health permitting...this is partly why I'm not a big believer in RRSPs. When I'm 65 I'll most likely be in my peak earning years. On another note, if I may. Do we have concrete evidence that boomers are downsizing? Yes, excellent evidence from multiple sources. I've posted before the article from the US showing at what point people become net sellers (varies by location, but every population does). not imply absolute real price declines, they suggest that in the next 40 years, house prices will face a more difﬁcult environment than the past 40 years. One in three is a huge number considering the wave of boomers. I'm not saying that this is not the case; however, every boomer I know is either staying in their present SFH or else selling their SFH in favour of a different SFH. A good demonstration of why the plural of anecdote is not data. By the way, even the boomers that don't want to sell will sell when forced to for health reasons. I myself have no plans to sell my home on retirement. I bought with retirement in mind. My parents - who are boomers - are retired and have no plans to move. Both sets of grandparents stayed in their homes until one partner had passed and the remaining person was too infirm to manage a home. All of my friends' parents - who are boomers - have stayed in their homes. Only one has moved into a care home because of dementia - she is 73 and moved last year. I don't think the downsize date for most folks hits until late seventies/early eighties unless there has been a long-time dream to do something different. Given that boomers are currently 49-67 and 42% will not retire at 65 and 25% state they will never retire, that is a good long window before involuntary downsizing would hit. I think what boomers will need in greater amounts are medical care, in-home assistance and services, and prescription drugs. Call it a stock tip. Can Marko or anyone else with access to the info please tell me if 754 Braemar (mls 316515) is a flip or is just back on the market after a few months. Also what was it listed at previously? Starter homes in Colwood begin at $265,000. If you need a home with a suite, they start at $270,000 in Sooke. Low bank water front in Sooke starts at $590,000. And you get a 17 year old 2,300 square foot home and a acre of land for that asking price. Same with Sidney where a starter rancher starts at $380,000. And you don't have to pay for a hundred million dollar new Blue Bridge in your taxes. New homes in Langford begin at $485,000. For the same quality of home that you have to pay $800,000 for a house along busy Cedar Hill Cross road here in town. Almost everything outside of the eight mile circle of downtown Victoria seems well priced. And the price differential between the outer and inner core areas seems to be growing. The lucky ones are those that no longer have to commute to a downtown cubicle or have decided that spending less of their income on housing is more enjoyable than a stick up their arse. Russ, previously sold for $686,500 and now they've put it back on. I wouldn't call it a flip, just a re-sale. I think there is validity to Ben's findings but I wonder about immigration and changing generational preferences. There are also a number of studies that point out that boomers are not a consistent cohort and that "seniors tend to stay in their current homes as long as possible, so many will likely choose to adapt their living spaces. Typically, young seniors are not living in accessible bungalows, so there will be renovations ... Another option is extensions to existing homes where seniors can live with their children." I find it interesting that there is an awareness of multi-family housing as an option for parents with grown children as a choice a significant number of boomers would make. Another trend is to move into a vacation property permanently. Listings for homes in Victoria City are way down. With only 80 houses listed for sale. Oak Bay is still high with 71 houses listed. There is a one-storey home listed at $519,000 along Kings Road which looks interesting since it previously sold in 2007 for $509,000. Maybe that's why it has been listed for 225 days after spending cash on updating the home. The vendors don't want to be the first to hang their head in shame by losing money on Oak Bay real estate. Maybe what they need is a good real estate proctologist. Nicely updated house on Fair St in Oak Bay now $495K. Smallish, but modernized and ready for new owners. I agree about adult parents sharing homes with their parents becoming more common here. Funny that it is again and option as it is the norm in a lot of the world. However, when doing this the parent is certainly retaining their home, but one or more houses are not bought due to the child(ren) now not being in the marketplace - more supply! Yup. And it's not the first one we've seen around here. I recall the infamous "it doesn't matter" response from Leo S to one of my better questions a while ago. Maybe no one here believes in 2:1 returning, but certainly 3:1. Still Fantasy Land! I think prices will decline gently for the next while. Long-term outlook is still very good, though. IMO. Yes, and this is how overbuilding can be hidden. Household size has been decreasing over the years. When circumstances push people back into sharing homes suddenly vacancies appear where previously it looked ok.
For sure. But it's now 2013. And next year will be 2014. Et cetera. I don't think anyone thinks a $250K house in OB will happen, either. I think a 4.5:1 is the ratio I would gun for at the bottom. That is not for OB, but all Victoria. These are estimates. Not exactly evidence. Fully agree. Although if, in this case, it's "plural of anecdote" vs. estimates, it doesn't seem like we have much of anything to work with. Some people spend more of their income on things like new cars, designer clothing, countless meals out; I choose to spend more of my income on housing in the core of Victoria. I thought a 3.5 to 1 ratio was the heretofor long-term mean to which some believe we will revert. that would imply a 50% rollback in average price as happened in some of the pricier markets in the US. I am not so optimistic as that, although I don't see how the next generation with average salaries of about $35K will be able to buy houses unless prices fall by something approaching 50%. For those who have already bought at the recent market high, the fall in price will likely be cushioned by some inflation, hopefully matched by increases in income. It depends on what neighborhood you are living in. Those neighborhoods that comprise starter homes will have the lowest income to price ratio. Areas in Oak Bay will have a higher ratio, not only because people are further along in their careers and making higher incomes, but they have larger down payments from selling a home in some other area to buy in Oak Bay. As we are at the end of the real estate cycle, all your seeing is the high end ratio, from people moving up the property ladder with bigger down payments. But that comes at a cost of a much, much lower sale volume. One of the lowest level of sales in two decades. But, no market and no business can sustain itself just by raising prices and losing sales. Businesses that rely directly or indirectly on real estate don't thrive only on high prices they need volume. Without an adequate level of sales, those businesses go bankrupt and their employees go on unemployment or move to towns that have jobs. This town can only support so many landscaping and roofing companies. And we are seeing that decline in the number of real estate agents already and that sweeps through all of the local economy. The provincial and municipal governments may be the last to make changes, but they will have to cut spending, reduce employment and raise taxes and fees. The low sales volume will likely push BC into a recession because of all the direct and indirect jobs that have been created to feed this property boom. That's bad for the individual, but good for the economy. Eventually, the reset button has to be pushed so that sale volumes can begin to increase again. And that can only happen with much lower house prices. But at least you can tell your grand children that you once owned a million dollar home. If you hadn't removed the second part of that quote you'd have your evidence. "The survey showed that being inadequately prepared for retirement (that is, not having enough saved) has compelled almost one in three Canadians to sell their homes and use the proceeds to supplement their income in retirement." Also did you read the article that Totoro posted? The fact that people become net sellers at a certain point is not debatable. You can debate about whether that age is higher in Victoria (as it appears to be in some other retirement destinations) but the fact remains that boomers previously boosted the housing market and are now starting to drag on it. The CTV coverage or the property assessments going down. I like how Shelley Mann is rallying the troops. "C'mon sellers we have to stick together. Don't drop your prices. NOBODY HAS TO SELL!!!!". Of course we all know that "sellers" is not a cohesive group. People who will need to sell will lower their prices. "This is not to suggest that house prices will fall by 40% over 40 years. We know that house prices are largely influenced by income growth, inflation, credit availability, interest rates, and un-quantifiable psychological factors. Rather, the paper is arguing that even if the underlying fundamentals improve markedly (and we know they are terrible at present), there will still be a headwind of 1% per year simply because of the net selling of homes by the boomer demographic. So , as an example, where residential real estate might otherwise appreciate at 4% annually, the impact of demographics will drag that down by one full percentage point per year." A bank survey and a blog. Solid. Look, I'll concede that boomers probably are and will be downsizing more than not; I just ain't seeing it around me. I'll leave it at that. We frequently hear the warning that one day interest rates will go up. I'll throw this out there: maybe interest rates will stay at "unprecedented, emergency" (info's favourite line) levels for a lot longer than anyone anticipates. I can honestly see this happening. For the last few years, the world hasn't seemed "normal" to me. Granted, I haven't been around for all that long, but that hasn't been enough to relieve my suspicions. So , as an example, where residential real estate might otherwise appreciate at 4% annually, the impact of demographics will drag that down by one full percentage point per year. Minus an additional .5% a year which is the lost boost from the boomers. Hence the unrealistic notion that Victoria real estate will continue as it has. "really, when it comes to actual foreseeable economic impact, the retirement and extended lives of the baby boomers will probably be the most significant economic event of the next 20 years. Not just because the generation now hitting retirement age is carrying a huge load of wealth into retirement relative to prior generations, and they’re going to expect long, active lives in retirement … and that means heavy spending on the upkeep of their bodies." I know this is off subject but I thought I would ask anyway. I see where ICICI is offering 3.15% on TFSAs. They are insured under CDIC and this is the best GIC rate anywhere in the country. The thing is when you phone for info their Indian accent is so strong that you can only pick up on say every 2nd word. If you only wanted to get a TFSA GIC....and not set up an account with them, I wonder how difficult it would be to redeem (by phoning them), after the 5 yrs before they roll it over again. 2.5% appreciation/year doesn't sound like doom and gloom to me. Right.. Because the performance of the last 40 years, when interest rates dropped by 80% is a great predictor for what will happen when rates are flat or increasing. A bank survey, a blog, and a professor. More seriously, I wouldn't hold off on a house purchase because of demographics - that is a slow moving wave - but I wouldn't be surprised if average real appreciation over the next 40 years is 0-1%. For the most part everyone who bought in 2007 ended up re-financing at a lower rate and now as we roll into 2008 looks like all of those who bought in 2008 will also refinancing at lower rates. I'd be just thrilled with 2.5% per year not adjusted for inflation. Why? Well because I get 2.5% on a huge whack of borrowed cash - like $500 000 worth of borrowed cash. Now, normally, you would ask - what about the costs of this borrowed cash BUT we are talking about a place to live so you have to factor in this cost to you anyway... ie. lets say the cost of borrowing is a wash with the cost of renting because money is cheap right now. I do agree that we will not likely see 4% per year again going forward. Part of this is demographics and part of it is the long run up in the cycle. By the time the cycle corrects the demographic factor may start to impact sales. "Boomers will increasingly sell their homes" and then what? live on the street? I really dislike all of those options - especially the last one. maybe interest rates will stay at "unprecedented, emergency" (info's favourite line) levels for a lot longer than anyone anticipates. Maybe this and maybe that. And who knows how long "a lot longer than anyone anticipates" may be. But if, as Introvert, hints he may believe that near zero real interest rates will continue for years to come, the consequences may not be quite as some would expect. Several governments seem intent on using monetary policy to target employment and GDP growth, not inflation. This implies increased inflation and thus likely increases in nominal interest rates, even if real rates remain near zero or fall below zero. Contrary to what some believe, inflation is easily created by money printing. All the government needs do is to lower the ratio of taxes to spending while covering the resultant deficit with ink money. Increased nominal interest rates would crush the housing market since they lower "affordability," without choking off investment in productive assets. Yeah, lest Introvert mention it first, forget the first two commas in my second paragraph. "When the parents of the first baby boomers retired, they went to Florida in the winter. That was about it for world travel and retirement plans. How times have changed. Boomers, and even their parents, are doing much more in retirement today including starting businesses. Some will start from scratch while others choose to invest in a franchise, where there is a proven model of success including training and support." "Through at least the next 25 years (i.e., past the time the last baby boomer turns 65), the retirement market will be far smaller than the oft-cited 78 million—regardless of whether one is referring to the number of people retiring or the number of living retirees. In fact, compared with today, the growth rate of either of those two measures will be less than 4% annually for the next 25 years—and could very well be zero." "David Madani of Capital Economics said Canada's real estate market is exhibiting the same cracks as the United States before the 2007 crash." "The upshot is that too many housing units have and are still being build, excesses that will eventually upset the balance of demand and supply"
"Home prices are likely to fall by around 25% over the next year or two." What do you think about the level of new condo stars in Victoria? Will we have an over supply in 2013? How will this effect condo prices? I don't think they are implying that they predict 4% growth annually. It was just an example scenario. Downsizing is a theory and a projection, but not seen in practice by me. I can see many boomers buying a motorhome and keeping their house. Moving into a care facility? This is 100% theoretical; never seen it happen voluntarily, which means it's probably not going to happen that much. Renting? That's a funny one! Move to a cheap warmer climate? Maybe, but I'm mostly seeing boomers moving to a more expensive warmer climate (Victoria or Vancouver). Passing away? Yuck. Introvert - they are all possible and were meant as a response to Dasmo's B&W "live on the street" comment. Just for background, my father is 92 and my Mom is 82. They still live in the house I grew up in and they do not want to leave but someday very soon, something's gotta give and that is true for all retirees eventually. "money flows....away from real estate"
Nope. Renting, moving and downsizing is all in real estate. money flows....away from real estate"
"the can retire at home"
OK, I'll give you 1 alternative to my 6. "couple sells big home" and buys a condo - agents get commission on both transactions money flows into real estate. "and spends remainder on food and travel...." money flows into the economy. I've been a client of theirs for about 3 years. I am also a client of several other online banks. I have not encountered any issues with any of them, including ICICI. Some people, when faced with a big empty nest, will downsize. It's a theory in the same way that gravity is a theory. You can't seriously argue that it doesn't happen to some extent as kids move out. Boomers increasingly have empty nests, even when they are not retired yet. Hence, increasing downsize activity. We don't know the exact numbers, but the direction is not in doubt. That is seriously illogical. "Dying? I've never seen it happen voluntarily, therefore I conclude that it doesn't happen very much"
@dasmo Money will flow, but it is flowing out of real estate. Not 100% of course, but partially depending on what people do. Some people will sell, some people will downsize, some people will take on a reverse mortgage, the end result is a flow out of real estate. All the increased spending on health care services, and fancy retire at home support contracts has to come from somewhere. The stats clearly state that the single biggest asset of many Canadians is their home. That has to be monetized to pay for those other things. "Some people will sell" is not money flowing out of real estate. Every sale requires a buy. So the money stays in real estate. "Renting, moving and downsizing is all in real estate"
"money flows into the economy"
Did you forget that these people have retired and are not producing income anyomre? So the money stays in real estate. no - selling pressure increases relative to buying pressure due to the population inbalance between employed and retired. ceterus paribus - lower prices = less money in real estate. Leo S said it better. Carth Turner has been predicting big wave of boomers selling their houses for close to 15 years, it may happen, but for sure will be in slower pace and in much smaller scale than predicted, as the past ten years has shown. I am boomer and so is my spouse and all my 4 older brother and sisters and their spouses, all between age 52 and 60. None of them plan to move from their houses after retirement except us, as we moved from snowy Ottawa to rainy Victoria. We bought a small house here first in 2004, 5 years before moving, but upgraded to a bigger and brand new one in Feb 2009, in the same neighborhood near UVic. Agreed that the housing market has been down and will be down more in next few years, but the correction probably has more to do with the house price bubble than boomers downgrading homes upon retirement. There are boomers with monster houses, but most are sensible folks like my siblings who have paid off modest homes and don't see any reason to change after retirement. Some of them may have okay pensions, so don't need money in the house; some of them, like us, without pension, but have less than 30% wealth tied in houses only, so there is no need to sell either, regardless the market condition. Remember that Garth is not selling his own home and still has about 30% of his wealth in real estate. So there is no need to make a big deal out of the boomer house selling. People do pass away all the times, but it seems that the average life span is getting longer (and people are healthier), so people may live in their home longer comparing to a generation ago, doesn't it? it seems that the average life span is getting longer (and people are healthier), so people may live in their home longer comparing to a generation ago, doesn't it? But it's a documented fact that people are less prepared financially for retirement compared to a generation ago. Longer life span, less retirement savings - where is the money to live on going to come from? From the one asset they do have. But it's a documented fact that people are less prepared financially for retirement compared to a generation ago. So there is a downside to the decline of unions! If people haven't saved enough, a more popular option is to work longer, as one always needs a place to live, and house selling money is not going to be enough either. It may be harder for people in a different generation to understand the boomers, than people in the same generation. The decline of unions is, so many would say, part of the downside to globalization which puts unionized workers in tradable goods and services in direct competition with Asians and other Third Worlders working for pennies an hour. Against that kind of competition, Unions either acquiesce in the face of declining real incomes or they put their own members out of work when they put employers out of business by attempting to extort wages that the market cannot support. The decline in real wages, more marked in the more industrialized US than in Canada, must be one factor for the relatively low price of US real estate. But almost certainly in Canada, as in the US, younger workers are mostly poorer than their parents were at the same age. That is a negative factor for real estate that will increasingly affect SFH prices here. The ubiquitous boomers ... are set to inherit an estimated $1 trillion from their parents over the next 20 years. Economists say it’s the largest intergenerational transfer of wealth in Canadian history. I bet the boomers will use the money to rent and not buy, and they'll also get a motorhome! "it may help baby boomers who are drowning in debt right now keep their heads above water as they approach retirement, experts say." "..set to inherit an estimated $1 trillion from their parents over the next 20 years." Let’s see, 1$T divided by 90 million boomers in Can&US equals a whopping $11,000 per boomer over 20 years or about $550 dollars per year per boomer to make up for their $100k salaries they’re now leaving behind. Correction, if it is only Cdn boomers then... $5500 dollars per year per boomer to make up for their $100,000 salaries they’re now leaving behind. Yep, most boomers are screwed. Boomers make $100k a year? My apologies--they won't need an inheritance. "Carth Turner has been predicting big wave of boomers selling their houses for close to 15 years, it may happen, but for sure will be in slower pace and in much smaller scale than predicted, as the past ten years has shown." I think you misundertand what Garth has been saying. The last ten years actually represent the earlier boomers prime income years of which some was converted into real estate. So the last ten years is not in any way indicative of boomer behaviour upon retirement. I have done my family tree going back some 400 years and some 2,500 ancestors. The data shows that of those that made in through the first decade of their lives they lived into their mid eighties. Their were two exceptions, those born in the 1700's and today's Baby Boomers. There is a significant increase in the deaths of Baby Boomers in my family between 50 to 65 years that was never seen in the prior 150 years. The BC Museum archive provides the death certificates on line and for free showing the reason for deaths in your family prior to 1980 - if they died in BC. Unlike today, very few in my family were Cancer or obesity related diseases. There may be more 80 year olds today, but that doesn't mean your going to get there. Personally, I think anyone who eats at a fast food restaurant more than twice a week, is less likely to make retirement age. A lot of the generations that follow the Baby Boomers are just simply Fukushimaed. ... that doesn't mean your going to get there. I was nearly fooled by that "ceteris paribus" having failed all my Latin exams. But it occurs to me that when talking of existing real estate, money neither goes into or comes out of real estate with changing prices. When sales occur, money goes from one pocket to another, in greater or lesser amounts depending on the price level. Money only goes into real estate when property is developed and buildings are constructed. Thus prices affect the flow of money into real estate only through their effect on the rate of new investment. Further, money never flows out of real estate, since neither land nor buildings can be sold except as real estate. On the bright side for the bulls, at least we are not as hard hit as Kelowna& Penticton yet. IF the seller gets $330,000, that is already 41% off in 3 years. Phenomenal Price!!! Buyer paid $561,750, in September, 2009. Fabulous 3 year old home located on a flat lot in the desirable area "Bridgewater", backing onto a beautiful creek with access to walking, hiking and biking trails. "Moving into a care facility? This is 100% theoretical"
Theoretical? As in they don't exist except on paper presumably, and if they do exist no one has actually moved into one. "never seen it happen voluntarily"
Now, don't we always volunteer to see something, like I volunteered to see an eagle fly over my house this morning. "which means it's probably not going to happen that much." Because you didn't volunteer to see someone move into a theoretical care home, it's just not going to happen that much. Introvert, just theorizing here, but isn't your obsession with grammar simply your subconscious attempt to hide the fact that you are a bit thick? Every time you clutter this blog with pointless complaints about your/you're it's really just you holding up your hand and saying, "guys, don't have anything useful to say but here's a grammar note that most of you probably caught already but didn't mattered much, but I did, because I'm a bit thick." CS, depends on what you define as "real estate" I took it as the industry in general in which "flow" is what is good. A transaction injects money into the industry through numerous ways; commissions, fees, renovations etc. When people talk about price affecting money "going into" RE, I suspect few are thinking of the effect of price on RE sales commissions, although you are correct that that is a minor factor. Renovations are a form of new investment, which I suspect is affected by the price level in something like the same way as new construction. Someone is more likely to spend $100 K on a new kitchen if they know the price of their property is going up than if the price has slumped. However, renos. and repairs must continue at some level even if new construction has come to a halt, otherwise all our houses would fall down. Happy Camper: Thanks for the info I am also a client of many on-line banks. With ICICI do you have a chequing/savings account as well so that you can transfer to and from a brick and mortar bank? If so, do they have a monthly/annual banking fee(s)? If they don't, I'll set one up first then purchase the TFSA through that new account. I noticed in order to be a client, they ask you to send two copies of ID such as a passport & drivers license. Do you recall if you were required to to this? Thanks for your time & interest as I appreciate it. Maybe, but have a look of his book titled "2015: After the Boom", the first edition was published back 1996/1997. I haven't read this book, but the title implies he is making a prediction about what will happen after 2015. How are you judging something as wrong that is in the future? Your idea that a large number of retiring people is a good thing is totally counter to the evidence and prevailing economic opinion. A large and increasing number of non-working population is absolutely _not_ a positive thing for the economy. 100k on a new kitchen. Craziness. Not saying you can't do it but I am saying do you need to - even for resale value. My challenge for my new kitchen is to see how little I can spend. I`m getting some good quality second hand cabinets and adding in old buffets and dressers. Actually, if you read the book, it is about what would happen in 2015 and the years proceed it, after the first set of boomers started reaching and over 65. Realistically, the vast majority will stop working or cut back and starting drawing CPP and other public services to a greater degree. That is not positive for the economy. 2878 Glenwood sells for 150k under assessment and 120k under original asking price. Down just over the 2006 assessment. Waterfront for under the victoria average. Needs work of course. Alexandrahere - there are federal guidelines that ICICI and all other banks follow regarding ID. This is part of the anti-money-laundering rules. Yes, transferring between any institution including a bricks and mortar bank is necessary in order to make deposits or withdrawals. Their online systems keep improving and work fine. My recollection is that they require at least one log one every 6 months or they automatically block the account in order to prevent fraudulent activity. I sometimes forget and have to phone them. It takes less than 5 minutes to resolve and they are always very polite. Regarding fees, my recollection is that at least one transaction is required within a time frame (12 months I think) or they charge an account dormancy fee. However, mine is not a TFSA account which is likely different regarding dormancy. The rules should be clear on their web site. There are a number of online foreign banks that have deposit insurance. Funny thing is, if you aren't working you have more time to spend money. Golf anyone? It's quite obvious now that Garth Turner has, again, accurately predicted a housing bust in Canada. We are in the beginning stages of a major correction right now. He also predicted the crash of 08-09 that was, as we all know, halted by a dramatic, unprecedented, emergency intervention. Since Garth is 2 for 2 and batting 1.000 in the last 6 years when it comes to predicting housing busts in Canada, I will be posting regular excerpts from his blog. Some of you have been posting lately that you think Victoria will not see a major price correction because prices have been "stable" or "level" for (5?) years. You are missing the big picture and not taking into account price/income ratio. Victoria reached a price/income ratio of almost 9.5 at its peak in 2010. That ratio has decreased to around 9.0 now which is still considered extremely overvalued. Vancouver is currently the second least-affordable city in Canada and Victoria is not far behind. I think I understand why you think current prices are "stable". It appears to be that way when you look at an average price chart. But the appearance of price stability at extremely overvalued prices is not stable at all. Once house prices reach extreme levels, price stability can only be accomplished (over time) if incomes increase quickly enough to catch up and provide price support. But that has not happened in Victoria. If it had, it would have shown up in the price/income ratio. That's what the ratio is all about. If stability has been gained over time, the price/income ratio would be much lower than 9.0. "Home prices are simply way out of line, especially when viewed in relation to household income. The ratio of house prices to income has historically averaged about 3.5 in Canada. It now stands at about 5.5. It is difficult to see how income growth in the future can bring this ratio close to the historical average within any reasonable period - so it follows that house prices will have to decline." "Well, the guy is right about national house values outstripping incomes, as this pathetic blog has oft detailed. In the last dozen years real estate inflated by almost 130% while household revenues grew by just a third of that. It would take a galloping economy, a tumble in unemployment and four yards of pixie dust to have incomes swell enough to justify home prices. But what Soper completely ignores is that housing horniness (for which he’s partly responsible) nudged home ownership up to 70%, those same families took on 180% more debt. We owe more now than the piteous Americans did the weekend before their real estate market started blowing up. So even if everybody gets a raise in 2013 the money will be sucked off into loan payments, not shoved into a down payment." There are lots of others, I'll let you google if you want." None of the above come close to conveying the message of Maclean's latest issue which is that we are currently in a housing collapse. The articles you point out only warn of a major correction. 812 Elrick place (Rockheights, Esquimalt) had an original asking of 530K last summer (2012 assessment was 528K), then was listed down to 465K after 3 price drops this fall. It just sold for 415K which is 115K below original asking (22% drop). Granted it needs a major facelift & renos (60s home) and the new assessment is down to 481K but the backyard has good views & there's potential to the place. On the other hand, a court-ordered sale with a leaking roof (so I hear) on 909 Alexander (Esquimalt) which was bought in 2007 for 500K (and assessed in 2012 at 555K) apparently has an accepted offer for 420K (court date is jan 16) when the asking price was 435K. Who would offer almost 97% of asking price in a court-ordered sale with a leaking roof?? @info "Since Garth is 2 for 2 and batting 1.000 in the last 6 years when it comes to predicting housing busts in Canada, I will be posting regular excerpts from his blog." Please do not. Your copy and paste jobs are irritating and do not add to the discussion. If we wanted to read Garth's blog, we would go there directly. I almost wonder if you are not trying to promote Garth. To be balanced, your copy and paste jobs add as much to the discussion as introvert's grammatical OCD. And yes, I do feel that there will be a price correction in Victoria. I'll take the pre-boom median price from around 2000 and project it forward at an annual average interest rate of, say, 2.5% to come up with whatever prices are going to revert to at some point in the future. When will depend on how hard the crash hits. Given current MOI and sales price:asssessed price ratio declines, I expect a maximum 2% per month same house price decline. Won't be shown in medians or averages as they will be skewed by people buying the same house for more $. Price declines could well flatten out if sales activity relative to new listings picks up. Taking everything together, I'd give a 5-10% median price drop this year, more on a same house (e.g. Case-Shiller) basis. SFH 3-month rolling median to be around 490 for the end of next year (currently 530). Predictions are a dog's breakfast even with a sopistichated model (instead of pulling things out of the air as I've done here. "Get a secured HELOC for $200,000 (a line of credit backed by your residential real estate) at prime – 3% – and invest it in a balanced portfolio (my fav is 40% fixed, 60% growth) making 8% or so. That’s a spread of 5%, which is sweet. Set up the HELOC with interest-only payments because then 100% of what you spend is deductible from your taxable income. This means $200,000 costs $6,000 a year to carry. In the 40% tax bracket, that drops to about $3,600 net. Meanwhile the portfolio earns $16,000 a year. If most of the returns come in the form of capital gains and dividends, that should be about $11,800 after tax. So, spend $300 a month in debt charges and receive almost $1,000 a month income – and have $200,000 worth of securities, secured by your equity." Completely at odds with everything he is saying about a crash....and it's also idiotic. "Completely at odds with everything he is saying about a crash....and it's also idiotic." Garth warns about a housing correction, but not a stock market crash. Get a secured HELOC for $200,000 (a line of credit backed by your residential real estate) at prime – 3% – and invest it in a balanced portfolio (my fav is 40% fixed, 60% growth) making 8% or so. Is he serious? Must be joking.